The cheese originates from the village of Cheddar in Somerset, South West England. Cheddar Gorge on the edge of the village contains a number of caves, which provided the ideal humidity and constant temperature for maturing the cheese. Cheddar cheese traditionally had to be made within 30 miles (48 km) of Wells Cathedral. Cheddar has been produced since at least the 12th century. A pipe roll of King Henry II from 1170 records the purchase of 10,240 lb (4,640 kg) at a farthing per pound (totaling £10.13s.4d., about £10.67 in decimal currency). Charles I (1600–1649) also bought cheese from the village. Romans may have brought the recipe to Britain from the Cantal region of France. Central to the modernisation and standardisation of Cheddar cheese was the nineteenth century Somerset dairyman Joseph Harding. For his technical developments, promotion of dairy hygiene and unremunerated propagation of modern cheese-making techniques he has been described as the father of Cheddar cheese. Harding introduced new equipment into the process of cheese making, including his "revolving breaker" for curd cutting, saving much manual effort. The "Joseph Harding method" was the first modern system for Cheddar production based upon scientific principles. Harding stated that Cheddar cheese is "not made in the field, nor in the byre, nor even in the cow, it is made in the dairy." He and his wife were behind the introduction of the cheese into Scotland and North America. Joseph Harding's son, Henry Harding, was responsible for introducing Cheddar cheese production to Australia. During World War II, and for nearly a decade after the war, most milk in Britain was used for the making of one single kind of cheese nicknamed "Government Cheddar" as part of war economies and rationing. This nearly resulted in wiping out all other cheese production in the country. Before World War I there were more than 3,500 cheese producers in Britain, while fewer than 100 remained after the Second World War. The state of Wisconsin produces the most Cheddar cheese in the United States; other centres of production include California, Upstate New York, Vermont, Tillamook, Oregon, Texas, and Oklahoma. It comes in several varieties, including mild, medium, sharp, extra sharp, New York Style, white, and Vermont. New York style Cheddar cheese is particularly sharp, and usually slightly softer than milder Cheddar varieties. Cheddar that has not been coloured is frequently labelled as "white Cheddar" or "Vermont Cheddar," regardless of whether it was produced in the state of Vermont. Vermont has three creameries that produce what is regarded as first-class Cheddar: the Cabot Creamery, which produces the sixteen-month-old Private Stock Cheddar; the Grafton Village Company; and Shelburne Farms. Perfect meal for any day of the week. In skillet, heat oil over medium heat. Place chicken in skillet, season with salt, pepper, garlic powder, onion powder and crushed red pepper, stir, cook about 5 minutes, until no longer pink. Remove chicken to plate, keep warm. Add red bell pepper and mushrooms to skillet, salt and pepper, to taste, stirring occasionally, cook until bell pepper is tender. 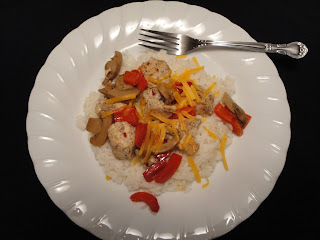 To serve, place cooked rice on dinner plate, top with chicken, red bell pepper and mushrooms. Sprinkle with cheese. Enjoy! What a very simple but delicious chicken dish to go with rice! The combination of chicken, cheese and mushrooms is something that my daughters really love! I get so overwhelmed when trying to broaden my cheese horizon. Cheddar is always my go-to cheese. Thanks for the quick and easy recipe. Nice and easy! Have a great week! Chicken and Rice is one of my favorite comfort food meals. Love this, Christine! I actually didn't know that's where cheddar cheese originated from--this dish looks savory and warm!